Let’s not kid ourselves. Living in Bangkok with its constantly cool happenings and vivid social scenes can be exhausting. The city has plenty to offer and much to love thereby, yet there are times even the conscientious city dweller will admit they’re one Sun Salutation away from losing the plot. Yet they don’t. And do you know why? They’ve cracked both code and muscles and gotten hold of these secret two words: spa resorts. Spa resorts in Southeast Asia are no recent discovery. We flourish in wellness on this side of the globe, between traditional Thai massages and ancient Ayurvedic practices. It’s something the region is particularly good at (besides food, culture, and shopping, though we digress), and it’s something that makes up a big part of our lives. After-work massages are a thing in Bangkok. Oil treatments and yoga are the norm in Mumbai. And you can’t really say you’ve been to Bali if you didn’t come back at least internally more beautiful. Regardless, it can be difficult and sigh-fully time-consuming to know and plan just where to head, or even where to start. Therefore, we’ve taken it off your busied list and put together a host of spa resorts in Southeast Asia for you to check out every month. From mountain to beach retreats and secret hideaways, unwind with a capital ‘U’ and practise the art of relaxation at these haunts. Inhale the wellness. Exhale the worries. And then definitely thank us later. 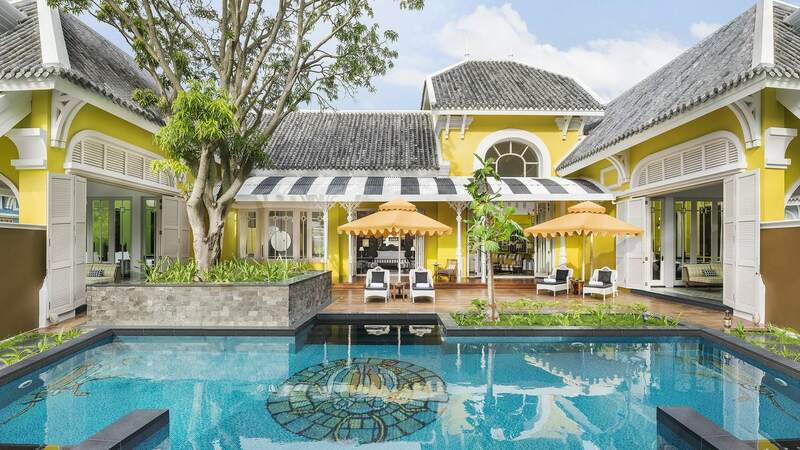 Welcoming the Thai New Year and celebrating a sense of Thainess in authentic spirit, the Four Seasons Resort Chiang Mai has launched a special Glorious Green Season package, inviting guests to immerse themselves in the scenic environment of the resort. 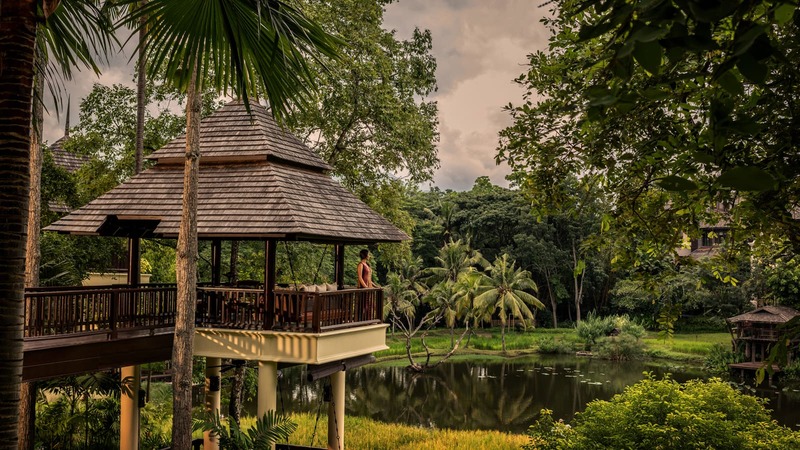 It’s a wellness retreat with a beautifully Northern Thai soul, whereby guests will slip on traditional clothing, experience rice farming in the paddies, go on a sensory Nature Trail, and indulge in up to THB 6000 Resort Credit at the spa. Proving that ‘wellness’ need not always translate to ‘massage’, it’s a calming way to become one with some of Thailand’s most tranquil and exotic natural environments, right in the heart of the ancient capital of Lanna. Stay in a pavilion room overlooking the rice terraces or in your own private pool villa for the ultimate serenely green sanctuary. The Glorious Green Package runs until 31 October for a minimum of 3 nights. Whilst Bali will always reign supreme as the ultimate isle to eat and pray and love, those looking for a bit more privacy on a path a little less beaten, may want to consider Gili Air. Here, Slow Private Pool Villas has mastered the art of living life true to their namesake: slow. 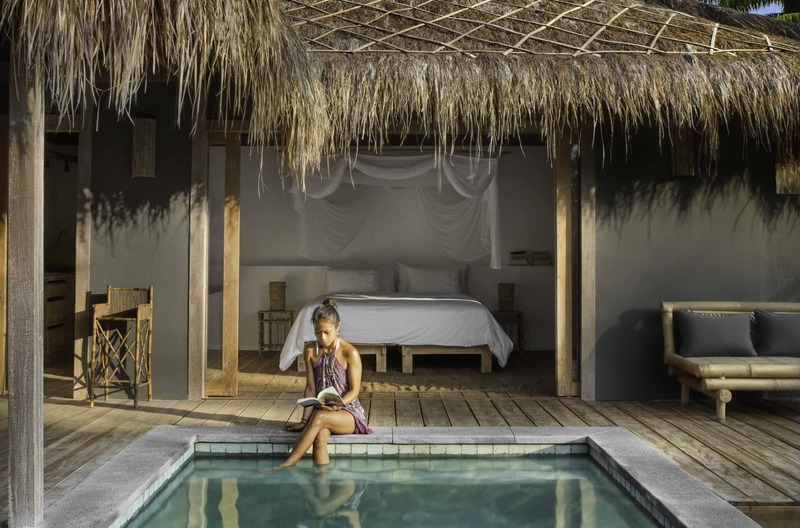 Based around a concept of slow cooking, slow moving, and slow stretching, the 10-villa resort and holiday village prides itself in nurturing essential values. Where the island is only a mere 2km long, there is much room for intimacy and relaxation here. The spa was designed by architect Christian Lechien, and features massage rooms and an over-sized granite bath for the ultimate unwind, with Lombok and Balinese spa treatments available. These follow ancient local healing techniques, combining peaceful surroundings with plenty of options for pamering. There’s a true sense of liberation here, which is perhaps the greatest wellness luxury of them all. 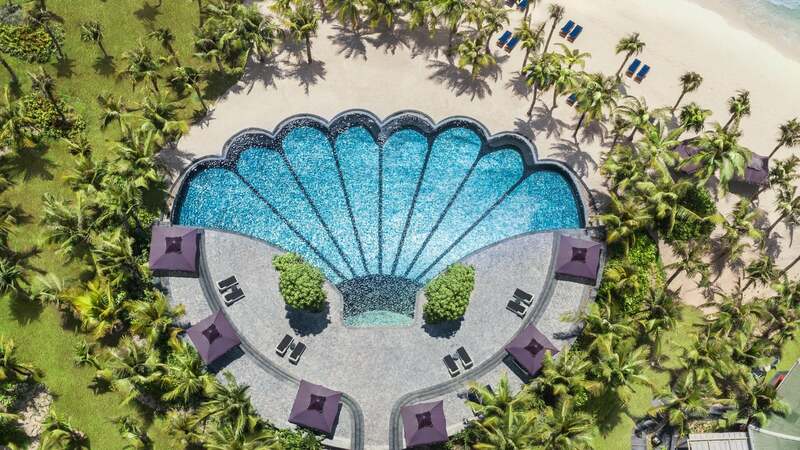 The JW Marriott Phu Quoc Emerald Bay Resort & Spa boasts quite possibly the most picturesque hotel swimming pool in the region, shaped like a seashell as the setting for the ultimate beachside getaway. Located on the shores of Khem Beach, the hotel sits on the land which once housed a 19th century French university, now transformed by the amazing Bill Bensley into a chic and eclectically designed resort. Likely the coolest and most colourful spa retreat of its kind, enter the summery-hued wellness centre for specialty Ayurvedic treatments, body wraps, and scalp massages, or take part in a massage lesson to learn the art yourself. A sweet retreat for couples, and anyone who loves to relax in the highly ‘grammable surroundings to suit. An hour and a half outside of the infamous pink city of Jaipur, Amanbagh is rural Rajasthan’s serene sanctuary with a romantic story. Once a compound for the Indian Mughal princes, the resort today still hones a sense of its decadent past, boasting a series of palatial suites for guests to stay and dream in. Pink marble and sandstone give off an aura of calm throughout the property, between lush gardens and a rich cultural heritage. Each of the 37 suites and pavilions have a private courtyard, as well as a deep soaking bathtub carved from green Udaipur marble, inviting a sense of revitalisation and rejuvenation from arrival. Every day, guests are invited to take part in a complimentary yoga class, with the option to practice amidst the surrounding natural beauty and temples, too. Wind down with a Maharaja or Maharani massage at the spa, combining Swedish and deep-tissue techniques to reduce tension, or beautify your body with the local artists’ Mehendi creativity. 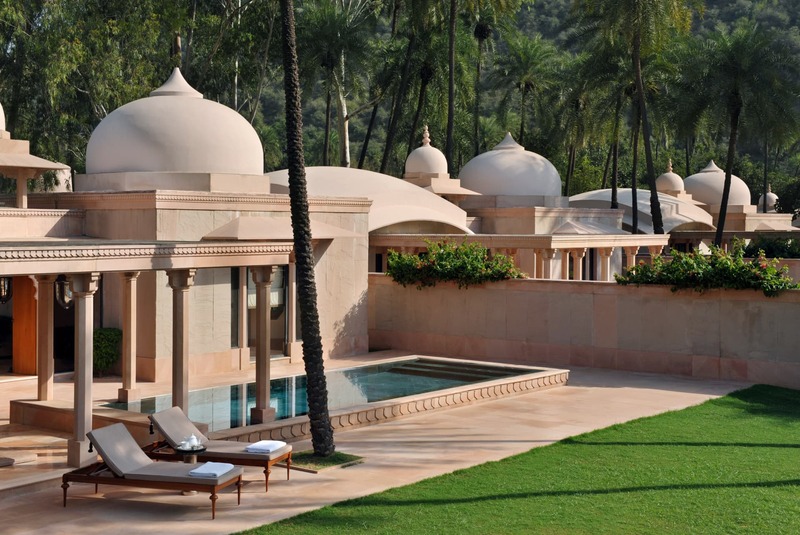 A true oasis at the foothills of the Northwestern Aravalli hills.